The latest automotive electronics boom has added many new features to engine control, entertainment, safety systems and more. In this very harsh environment that an automobile will experience, there are stringent features that need to be a part of any electronics devices is the system. At a minimum, any IC needs to see robust operation in a wide range of voltages while handling transients of more than 36V in many cases. electromagnetic interference (EMI) emissions need to be minimized and high efficiency in this tough thermal environment. The automotive battery has a huge drain on it with added electronics features so low power and high efficiency are critical in these designs. System solutions need to be small with high power density as well as 2 MHz or higher switching speeds in order not to interfere with AM radio performance as well as keeping active components small that surround the power devices. Finally, very low quiescent current below 10 uA is necessary to enable always-on systems for security, infotainment and environmental systems to be aware and ready without a drain on the battery when the engine is off. 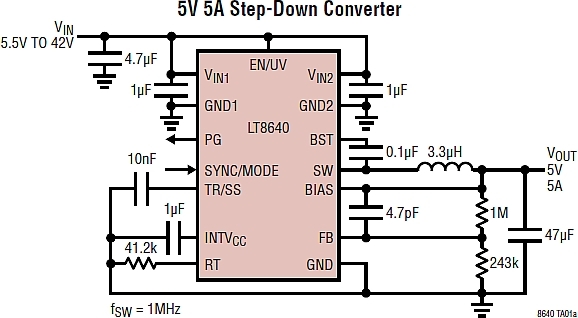 From my industry observations Linear Technology has kept these issues at the forefront of their Silent Switcher series for usage in automotive applications. I especially appreciate the spread spectrum addition to these regulators along with solid synchronous regulation to enhance efficiency.